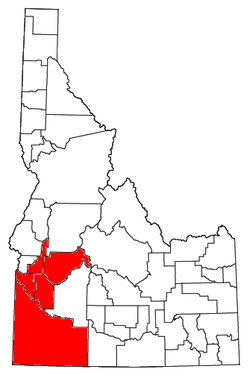 The Boise City–Nampa, Idaho Metropolitan Statistical Area (MSA) (commonly known as the Boise Metropolitan Area or the Treasure Valley) is an area that encompasses Ada, Boise, Canyon, Gem, and Owyhee counties in southwestern Idaho. It is distinct from the wider Boise City–Mountain Home–Ontario, ID–OR Combined Statistical Area, an area consisting of seven counties in southwestern Idaho, and Malheur County, Oregon anchored by the cities of Boise and Nampa. It is the state's largest officially designated metropolitan area and includes Idaho's three largest cities – Boise, Nampa, and Meridian. Nearly 40 percent of Idaho's total population lives in the area. As of the 2018 estimate, the Boise City–Nampa, Idaho Metropolitan Statistical Area (MSA) had a population of 730,426,  while the larger Boise City–Mountain Home–Ontario, ID–OR Combined Statistical Area (CSA) had a population of 811,961. The metro area is currently the third largest in the US section of the Pacific Northwest after Seattle and Portland, and has replaced Akron, OH as the 80th largest metropolitan area in the United States. As of the 2010 census, there were 616,561 people, 170,291 households, and 120,118 families residing within the MSA. The racial makeup of the MSA was 89.80% White, 0.52% African American, 0.80% Native American, 1.38% Asian, 0.14% Pacific Islander, 5.02% from other races, and 2.35% from two or more races. Hispanic or Latino of any race were 8.96% of the population. The median income for a household in the MSA was $36,695, and the median income for a family was $42,196. Males had a median income of $31,854 versus $23,244 for females. The per capita income for the MSA was $17,041. ^ "Stevens-Henager College – Accredited Colleges in Utah & Idaho". Stevenshenager.edu. Retrieved 2015-12-30. ^ Sam Harmer (2015-12-15). "Micron Technology, Inc. - Home | Memory and Storage Solutions". Micron.com. Retrieved 2015-12-30. ^ "St. Luke's – Home". Stlukesonline.org. 2015-05-15. Retrieved 2015-12-30. ^ "Boise Idaho Hospital | Saint Alphonsus | Ontario Oregon Hospital". Saint Alphonsus. Retrieved 2015-12-30. ^ "J.R. Simplot Company". Simplot.com. Retrieved 2015-12-30. ^ "Jobs and careers at HP | HP® Official Site". Hp.com. 2015-11-01. Retrieved 2015-12-30. ^ "Health Insurance Career Opportunities at Blue Cross and Blue Shield". BCBS.com. Retrieved 2015-12-30. ^ "Welcome to Union Pacific Careers". Up.jobs. Retrieved 2015-12-30. ^ "T-Mobile Jobs & Employment". T-mobile.com. Retrieved 2015-12-30. ^ "DIRECTV Careers". Directv.com. Retrieved 2015-12-30. ^ "Apply Now | Teleperformance". Teleperformanceusa.com. 1970-01-01. Retrieved 2015-12-30. Wikimedia Commons has media related to Boise metropolitan area.